Okay, so I’m sure most people have a better idea of what a Bundt pan is than the Portokalos family, but just in case you’ve never actually baked in a Bundt pan, I’m going to share all you need to know. And, of course, you can expect lots of Bundt cake recipes along the way. 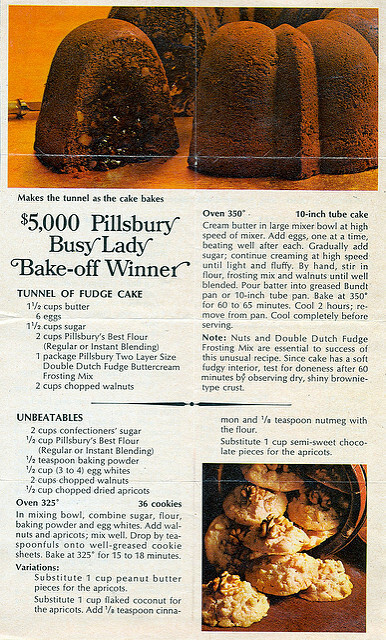 But, the Bundt pan didn’t really take off until 1966 when a woman who entered the 1966 Pillsbury bake-off won second place for her “Tunnel of Fudge” cake – a cake that was baked in a Bundt pan. Bundt Pan vs. Tube Pan: In short, all Bundt pans are tube pans, but not all tube pans are Bundt pans. 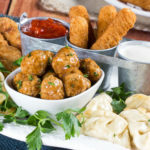 Traditionally, a tube pan is a deep baking pan that’s straight-sided with a hollow tube in the center. Some tube pans come with removable bottoms to make it easier to remove the cake from the pan. Tube pans are typically used for making sponge cakes or angel food cakes, which need the tall, straight sides for climbing. A Bundt pan also has a hollow opening in the center, but the size and shape of the opening can vary. 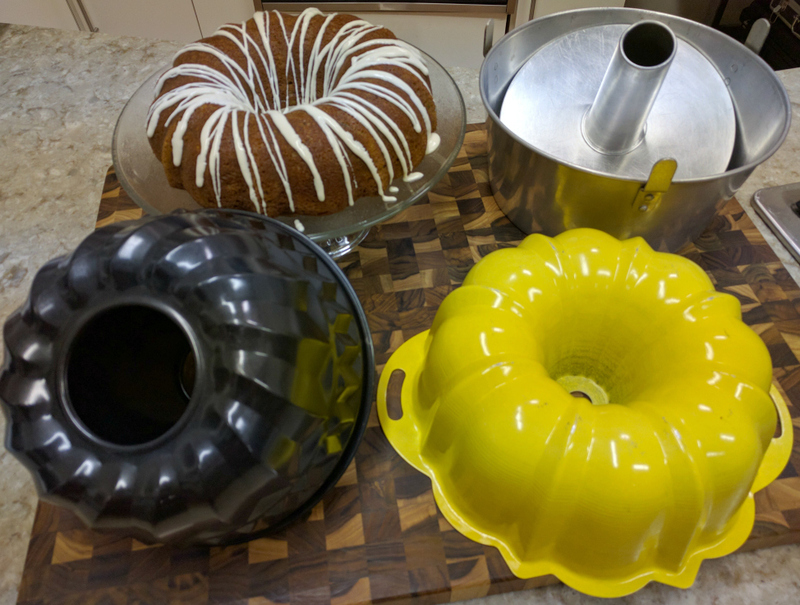 Also, Bundt pans usually have a decorative design, which makes it a better choice for dense and moist cakes like pound cakes and coffee cakes. Here we’ve got two Bundt pans (front) and a tube pan with a removable bottom (upper right). Keep This in Mind! In most cases, you can substitute a Bundt pan for a tube pan, but always check the recipe’s notes to be sure. Why the Hole? The hole in the center helps the cake to bake evenly. 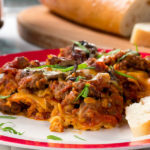 Without it, your tall or dense cakes may not be done all the way through. This is also why Bundt cakes usually bake at a lower temperature for a longer time period. All the Options: The first Bundt pan may have been a simple fluted ring, but nowadays Bundt pans come in all sorts of sizes, shapes, colors, and materials. There’s even mini Bundt pans! If you’re going to be purchasing a Bundt pan, always go for one that’s got a nonstick coating. If not, you’ll have to make sure every nook and cranny is greased before putting in your batter. 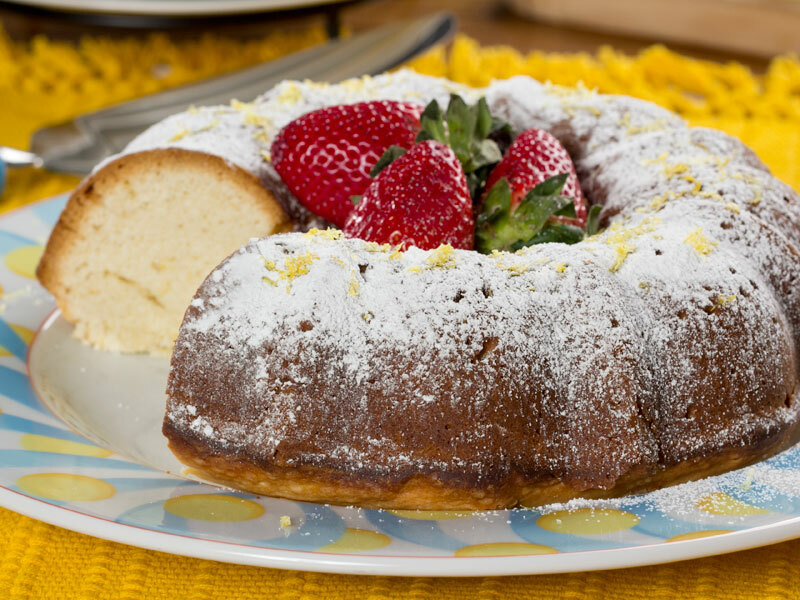 Check out these cakes made in different Bundt cake pans! Well, now that you know a little bit more about Bundt pans I think it’s time you go bake one! If you want even more Bundt cake recipes than the ones I’ve shared, check out the “Best Bundt Cakes” collection on www.MrFood.com. And if you’re already an avid Bundt cake maker, then I recommend you follow #BundtBakers on Pinterest. 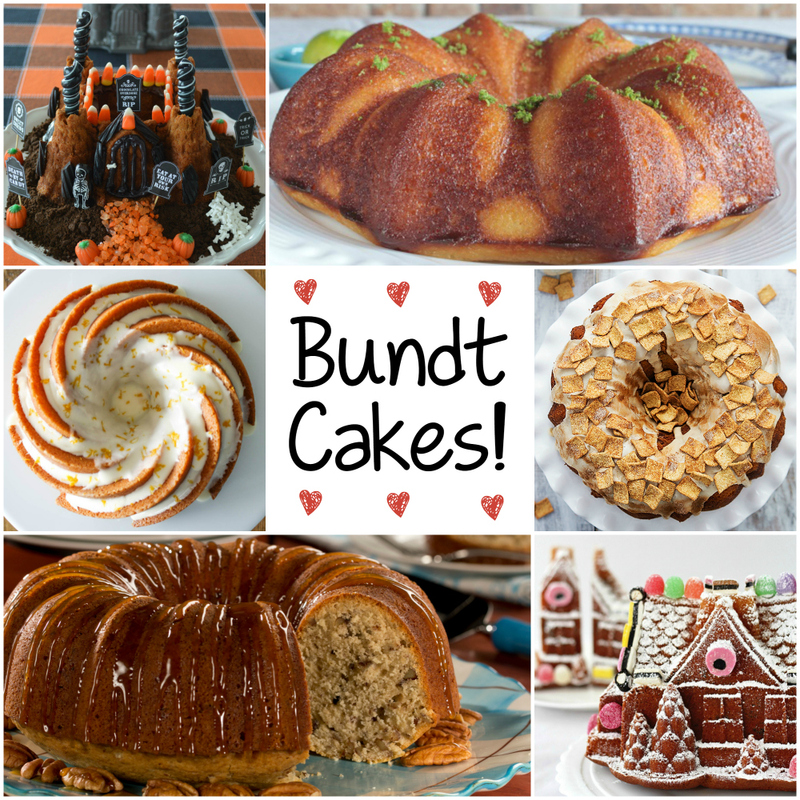 There are so many great ideas from Bundt lovers like you! 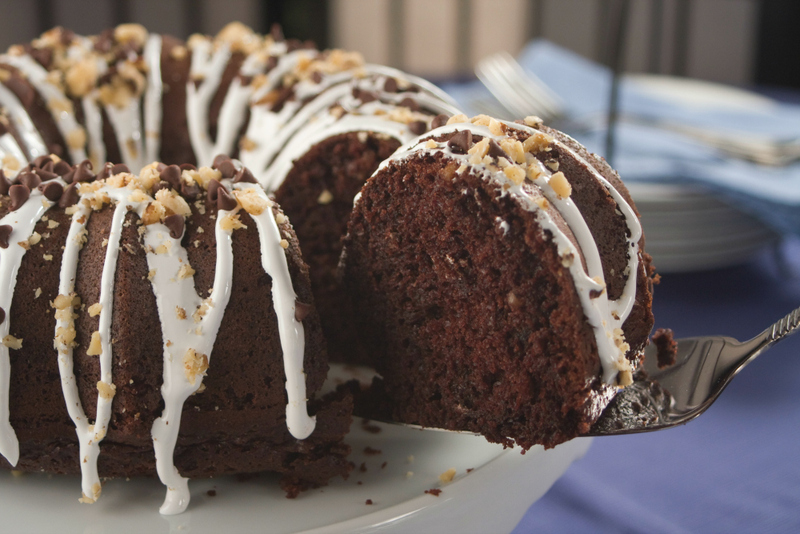 What’s Your Favorite Kind of Bundt Cake? My favorite Bundt cake is “Streusel In -Between Pumpkin Cake” which I found in the 2006 Fall Baking, Betty Crocker monthly magazine. My favorite Bundt Cake(s). 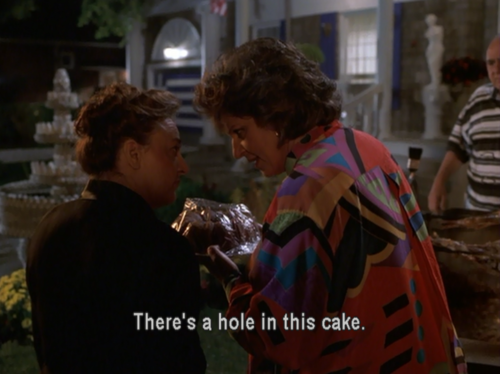 1) Too Much Chocolate Cake and 2) Sour Cream Coffee Cake (got this from my Mom). Oh, and thanks, for the Bundt Bakers on Pinterest heads-up. Will definitely be checking that site! I promised my BF a lemon bundt cake. I have never make any kind of bundt cake. Should I start with a cake mix? love all bundt cake recipes , but when wiil they comeout with cake mix especailly for this type of cake . Hope all this mr food recipes for bundt cake are as good as his other recipes are .